Pedestrian accidents can happen at any time, usually without warning. Unfortunately, pedestrian accidents tend to be critical and even deadly, because the pedestrian’s body is completely exposed to the force of the vehicle. Here are the top causes of pedestrian accidents and what you can do if you or a loved one were injured in this type of collision. When a crosswalk for pedestrians is not properly marked, drivers may have a difficult time realizing that pedestrians frequently cross there. Additionally, jaywalking where there is no crosswalk also puts a pedestrian at risk. Although there aren’t laws against pedestrians using their cell phones or tablets while walking, paying attention to a device in your hand can be as dangerous as a driver using that technology. Often, cell phone users will step out in front of a car without realizing it, putting themselves in a position to get hit. A large portion of pedestrian accidents in Georgia occur when cars make left handed turns at intersections with crosswalks. 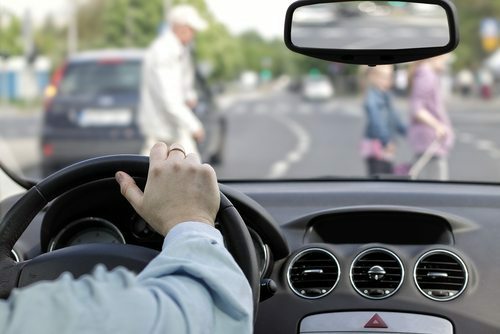 The driver is watching the traffic to see when he or she can make the turn, and the pedestrian is typically looking straight ahead while walking. Even though a vehicle isn’t going very fast during a left hand turn, it can still cause significant and even fatal damage if the vehicle hits a pedestrian. DUIs are not only responsible for a large number of vehicle-on-vehicle crashes, they’re also responsible for many pedestrian accidents. Drunk drivers have a reduced ability to see and properly react to pedestrians in or near the road. Additionally, drunk drivers may veer off the road and hit pedestrians who are walking on the sidewalk. Pedestrians who walk at night while wearing dark clothes make themselves less visible to cars, potentially leading to an accident when a motor vehicle driver can’t see them in time. Always wear bright or light clothing when walking at night and consider using reflective gear to make yourself more visible to oncoming traffic. Because pedestrian accidents often result in critical or fatal injuries, it’s important to secure legal representation from a pedestrian accident attorney as soon as possible after you or a loved one are hurt. Contact Appalachian Injury Law today for a consultation by calling (706) 515-1995.